On Monday morning I had a session with Pete and spent the rest of the day working. After my yoga class on Tuesday morning, I settled down to a full day of work. I would usually have gone to the supermarket for the weekly shop but I was so fed up of getting a cab there and back. Kaleem, our driver, was back at work the next day so I decided I’d wait one more day. I was ready to leave the house at 9am on Wednesday morning, but when we got to the car it wouldn’t start. After sitting in the car park for two months, the battery had died! Kaleem called one of his friends and they tried to get the battery started using jumper cables but that didn’t work either. At 9.40, Ajay (the cook) and I decided to cab it to the supermarket. I was supposed to have a session with Pete at 11am and I didn’t think I’d be back in time. He was fine about me cancelling so late and said he could do the following day instead. As we’d gone to the supermarket so early, we didn’t encounter as much traffic as we normally would have and by 10.40 we were on our way home. I went to the gym anyway and then settled down to some work. After my Thursday session with Pete, I worked the rest of the day. That night, I went to see Texas in concert at the Dubai Tennis Stadium. I’d seen them live in January 2014 at the Irish Village (but had taken a break from blogging then). The venue this time was larger and there were seats. We could sit anywhere we wanted so we got some drinks and made ourselves comfortable. The concert was brilliant – Sharleen Spiteri’s voice is still incredible, even after twenty-five years. They opened with ‘I Don’t Want a Lover’. This was followed by ‘Halo’, ‘When We Are Together’ and ‘In Our Lifetime’. She sang a couple of songs from their latest album which I didn’t know – ‘The Conversation’ and ‘Detroit City’. Then back to their old stuff: ‘In Demand’, ‘Summer Son’, ‘Black Eyed Boy’. They finished with ‘Say What You Want’ and said goodnight. What I like about her is that she chats to the audience a lot! Their first encore was a cover of an Al Green song. What an amazing vocal range she has! They then performed ‘Inner Smile’ which is my favourite song of theirs. Unfortunately as I was recording it, the camera on my phone froze and I lost the entire recording. So… here’s the one from last year. I thought that would be their last song, but they did a cover version of Elvis’s ‘Suspicious Minds’ after that. It was after 11pm when they finished and I was home by 11.30pm, which was nice. I ended up working until 2am and went to bed. I was home all day on Friday, mostly working. That evening Dad and I went to Mercato for dinner. We thought we’d try somewhere different and ended up at a Jordanian restaurant called Azkadenya on the first floor. We ordered one hummus and one fatoush to start with. 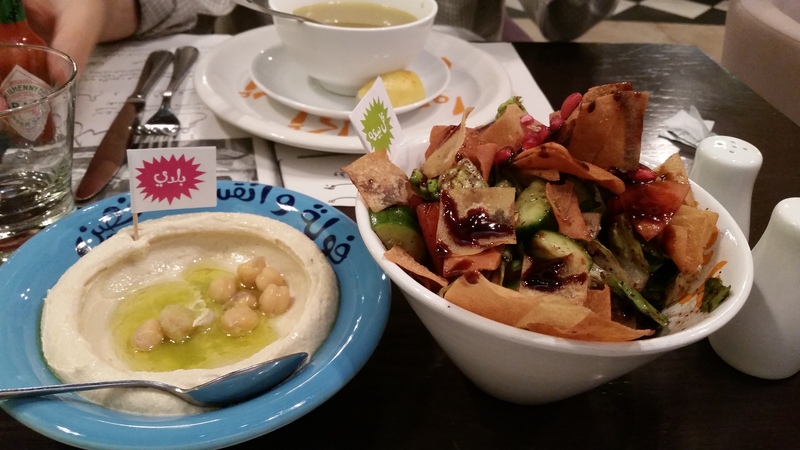 The starters were really good – the salad was fresh and the hummus was creamy. Dad ordered a shish taouk for his main course and I had the lamb cubes. Both were very good but the portions were big – we could have shared one dish between us. After dinner we still had some time to kill before the movie so we went to the Chocolate Bar for a coffee (for him) and hot chocolate (for me). At 8.30 my cousin and her parents joined us and we went to see the new James Bond movie, Spectre, together. I wasn’t expecting much from it, but I enjoyed it. I think I’d have enjoyed watching anything that involved Daniel Craig running around for two hours!